I have just added an "etsy" shop to my list of ventures. Click the link over there, on the left of this blog page, to visit my online shop. I will be posting some of my prints, greeting cards (featuring my watercolors) and a few small original watercolor studies (that will only be shown on etsy). Also, just to let you know that the limited edition giclee print, "Vintage Number 2" shown at left is now framed at Margot's Gallery and Frame in downtown Oxford, Michigan. It is slated to be hung in a local restaurant. I think the black mat, wood frame with matching fillet looks so very classy...traditional! I have the original framed in a metal frame with a white mat, and it looks more contemporary. It is amazing how the framing and mat can change the look of a piece of artwork. 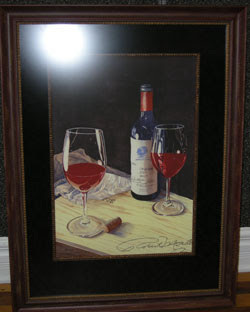 If you are interested in one of the Wine Series paintings, visit my website for more information by clicking here. I have limited edition prints, which are selling quickly, and a few originals are still available. Thanks for visiting!